Zachary Belinsky, BA religious studies ’14, sees religion as a force to unite members of society rather than divide them. Belinsky has worked tirelessly at AU to bring faith communities together and to start the dialogues that can ultimately make the world a more productive, harmonious place. As a result, when he started looking into fulfilling the internship requirement for his major, the Interfaith Conference of Metropolitan Washington seemed like a perfect choice. Belinsky, who serves on the Interfaith Council at AU as well as the Shabbat Committee that plans Friday night services and dinners for the Jewish community on campus, was originally attracted to the Interfaith Conference because of his positive experiences facilitating dialogues across faiths at AU. 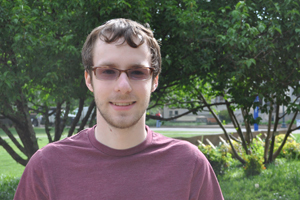 “It turns out that the IFC does so much more than that,” he says. “They actively work on a variety of social justice issues with the belief that a wide range of faith traditions share social justice as a common ideology. We can draw upon these common beliefs and speak much more strongly with a collective voice than as individual faith groups.” Belinsky also serves as the Interfaith representative in AU’s Buddhist Exploration group and was one of the founding members of the Religious Studies Club. Belinsky emphasized how the issue of contraception is a religious freedom issue, but it also concerns social justice. “This issue isn’t one or the other,” says Belinsky. “It’s both. The goal of our statement was to condemn the use of this issue as a political wedge between people of faith.” His statement is still in the final approval process, but Cardinal Donald Wuerl of the Archdiocese of Washington recently approved it.